If you have ever wanted to programmatically parse past or current Tfs Build log data, then this post is for you. My company uses Tfs to implement a Rolling CI Build which often involves multiple Changesets per build. For the most part this is smooth sailing, however when the build breaks we want to to quickly be able to pinpoint the source and notify the guilty party. With multiple Associated Changesets per build, with multiple files checked-in by multiple developers, how to we efficiently pin-point to source of the break. We also do not want to parse the MSBuild log files since we are not creating log files for our Rolling CI Builds. Our solution then become querying and parsing the xml build information from the Project Collection SQL Database. All the build log information is available on the Project Collection Database where the data is recorded one activity at a time so we are able to query all the way up to the current build activity. All this data can be found in the SQL Database, appropriately named Tfs_YourTeamProjectCollection, table Tbl_BuildInformation; where YourTeamProjectCollection is the name of your Team Project Collection. The build activity will appear as independent XML nodes, divided up into 16 different types. Fields: Contains the XML data that we are interested in. Even though there are 16 different NodeTypes I am interested in only 5 of them. I had some difficulties finding documentation on the NodeTypes, so here is are examples of the XML Fields Column of each the NodeTypes that I use. The structure of all the NodeTypes are the same, and any value can be retrieved with the the XPath string “/Fields/Field[@Name=’AttributeValueOfInterest’][Value]”. For the sake of simplicity, I will only be referencing the ‘AttributeValueOfInterest’ from here on out. This NodeType contains the MSBuild results for a Project or Solution component of your Build Targets. It provides the number of build errors or warnings for specific build. The Build Agent Local Path and the Server Path of the Project or Solution being built. Expect to see one entry for each Project or Solution Built. This NodeType contains the MSBuild results for all components of your Build Targets. It provides the number of build errors or warnings for specific build. This NodeType contains contains the information of an individual Changeset from the list of Associated Changesets. It contains the ChangsetId, who checked it in, and the the check-in comments. 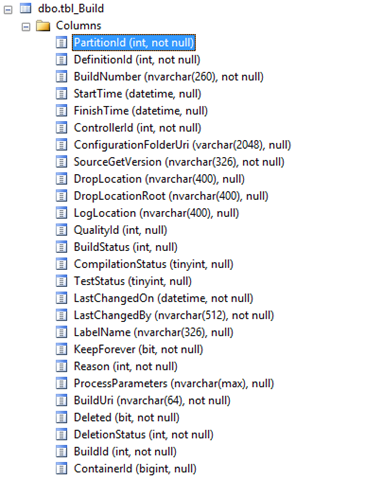 This NodeType contains contains any errors that are created during any build activity. These can be anything from compilation errors, network errors, to user created errors through the WriteBuildError class in the build process template. 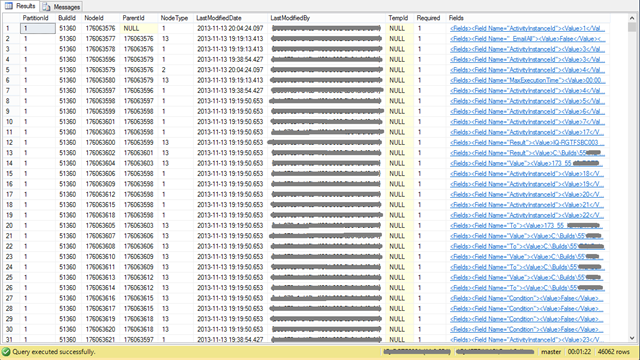 As an example I will post the Fields Column XML for a compilation error. It is important to note that for error types other than compilation error, the AttributeValueOfInterest File, ServerPath, LineNumber, EndLineNumber are not present. This NodeType contains any warnings that are created during any build activity. This is very similar to NodeType 8, build activity errors. The build process template class for user created warning is WriteBuildWarning . 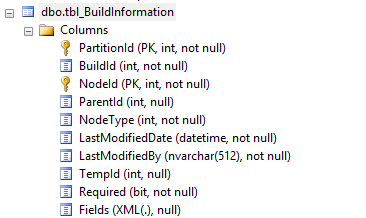 And as for the errors above, the posted example of the Fields Column XML for a compilation error. It is important to note that for warnings types other than compilation warnings , the AttributeValueOfInterest File, ServerPath, LineNumber, EndLineNumber are not present.